f you’re going to make a grand entrance or a graceful exit, it helps to cut a fine silhouette. 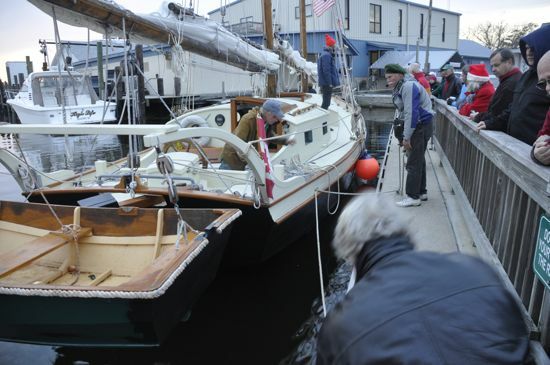 In December, a boat from Nova Scotia showed how both are done. “Ask For” out of Tatamagouche, Nova Scotia, during a stop in Oriental in December. “Ask For” first glided in to view near sunset, moments after the tail end of Oriental’s Spirit of Christmas parade had just passed by the Town Dock. Parade spectators who looked out toward the harbor were treated to the approach of a boat out of another time. It was as though this were another event in the Spirit of Christmas line-up. What little light the sun had left that day, seemed to gently push “Ask For” towards Oriental’s Town Dock. Crew member John Pankhurst on deck with captain Tam Flemming at the wheel. A few helping hands on shore for “Ask For“s arrival. As the boat’s captain Tam Flemming, and his crew of four neared the wharf, hands reached out from the shore for ther lines. 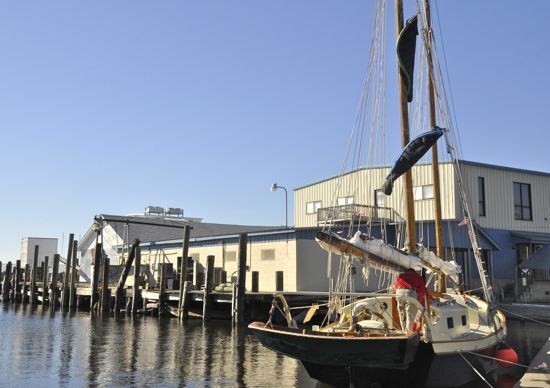 Once the centerboard came up, the 45-foot long boat — a skipjack schooner — was pulled snugly to the wharf. Drawing only about 3 feet, she could. 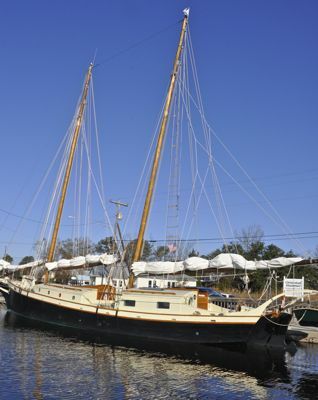 Tam Flemming built “Ask For” over the course of 5 years, launching the wooden skipjack schooner in 2010. This was the boat’s first trip down the East Coast. Destination: the islands. Turning heads is nothing new for “Ask For”. 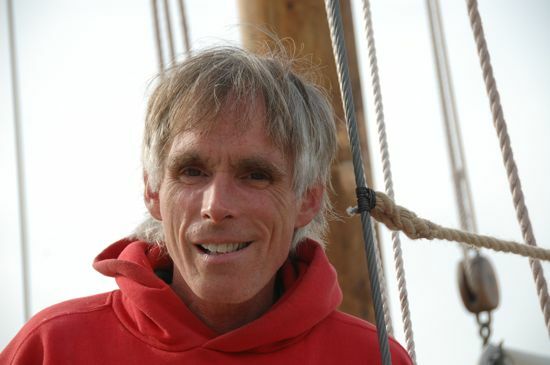 Tam Flemming says he spent five years building “Ask For” near Tatamagouche on Nova Scotia’s northern shore. 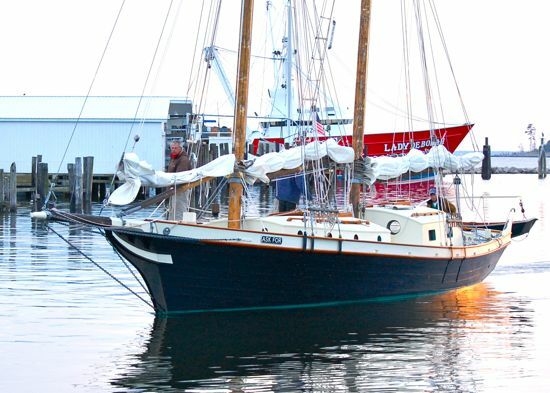 When he launched “Ask For” in the summer of 2010, the Truro Daily reported, 200 people turned out, among them, the widow of the man who had first dreamed of building the boat, but who died leaving only the hull. 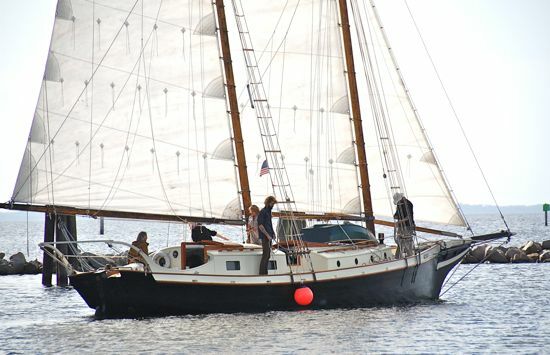 According to the Nova Scotia newspaper, she had asked Tam to take over the project, about the same time he’d been thinking of building such a boat. By that account, that’s how “Ask For” got its name. Trans-Canadian crew of “Ask For”. From left, Lys Hermanski, Paige Littlefair, John Pankhurst, Tam Flemming and Mark Jennings. Fast forward to December of 2011: what Tam Flemming was asking for was a winter in the islands and toward that goal, he and the crew were making good time. A snowstorm had delayed their departure from Nova Scotia and they’d only gotten away from Shelburne on the southern coast on November 26. Two weeks later, they pulled up in Oriental. Those would be sleeping bags drying in the rigging. They stayed for just two days, enough time to dry out sleeping bags in the rigging and do a bit of provisioning. And then at midday on Monday, Tam and crew started to raise sails while at the wharf. After a bit of fending off, they raised the others in the harbor and sailed off, just as they arrived, seemingly out of another time. Farewell to Oriental. 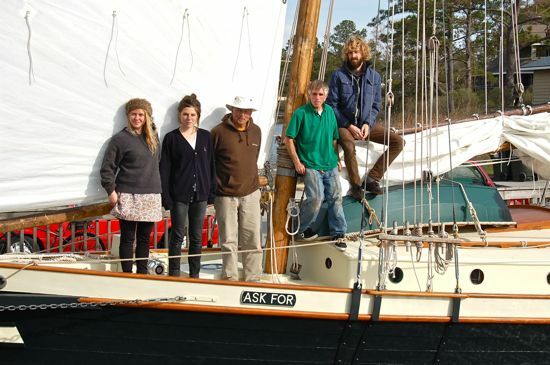 “Ask For” slips out of the harbor, all ten hands on deck.